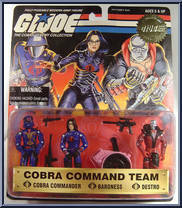 Blizzard Blizzard joined the G. I. Joe team before its closure by the government. 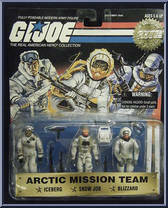 His experience as an Arctic Instructor made him the man to train under. To survive his kind of warfare, you not only . . .
Baroness The Baroness was the spoiled offspring of European parents who made sure that she and her brother, Eugen, had the best of everything in life. During the time of the Southeast Asian conflict,. 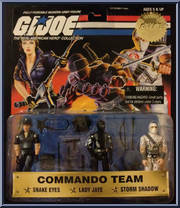 . .
Lady Jaye Lady Jaye graduated from Bryn Mawr and did her graduate work at Trinity College in Dublin. She is an expert at covert operations, with a background as an accomplished actress and linguist. . . .